I LOVE Infadolan! Anyone else?!! 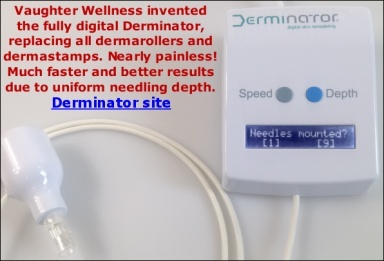 I have just did my third dermarolling session today. I will update with my photos before and after when I see very obvious improvement. So far the improvement is subtle, and I'm very happy with the result. Anyhow, I have found that I am so in love with Infadolan. Thank you Sarah for introducing me to this wonderful ointment. I have found so many uses for it. I applied it around my eye. I have dry skin patches on my body, and this ointment is GREAT for these dry patches, including eczema patches. I also applied to scratches and small cuts and it really help the healing process. The vitamin A in the ointment is high enough to help the healing of the skin not just dermarolled skin. Anybody else love this wonderful ointment?!! To Sarah: Please consider stocking your store with 100g size of Infadolan. Re: I LOVE Infadolan! Anyone else?!! Thank you very much for writing about your experience with Infadolan! Infadolan is primarily intended for dermaneedling aftercare (especially if using longer than 0.5 mm needles) but it has also other uses. It is too oily to be applied as a daily overall facial care but it is very suitable for the purposes that you mentioned - dry areas of the face (around the eyes, on the lips, eczemas, dermatitis etc. ), dry areas anywhere on the body (great for protection of the back of the hands, cracked heels, eczemas, xerosis, cuts etc.). Infadolan is a semi-occlusive. It prevents the evaporation of water from the skin, thus being excellent for dry skin. Dry skin is caused by increased water evaporation from the skin due to a compromised outermost layer of skin barrier, making it not function properly, causing excessive evaporation. Infadoan serves as a moisture barrier. It also facilitates the re-epithelisation of the skin. Can we roll in the infadolan? There is no reason to do it. It will stick to the needles and it will be difficult to remove. Infadolan is supposed to lay on the top of the skin and protect it and prevent water evaporation. The vitamins get absorbed like that too. Ok. I have bought the copper peptides serums, and infadolan with rollers and was thinking that if I wiped off the excess ointment before rolling, that I cud roll in any remaining vitamins and get more from it that just have it sitting on the skin post rolling where less vitamins may get absorbed. Same for something like green tea. But then heard green tea was anti inflammatory so that might stop the skin from producing collagen i.e. allowing the inflammation to run its course post needling. Any thoughts? Just wondering if I would do any damage? I may not be the most knowledgeable person on this, but retinyl acetate and vitamin D are not the only ingredients in Infadolan. It also contains white wax, lanolin and petrolatum. I like the ointment especially after rolling and stamping because of its occlusive and non-anti-inflammatory properties. I wouldn't want to roll or stamp while the ointment is on my skin because (1) I don't want wax, lanolin and petrolatum to be pushed into my wounded skin and (2) it would be difficult to clean and disinfect the stamp and dermaroller afterward. I just like the ointment to sit on the skin and perform as an occlusion while providing collagen building vitamin A to the wounded skin. I found that my skin heals really well with the ointment. I also found a scientific paper on it as well, but I can't find it now. Based on what I've read, copper peptides is good for wound healing which is applicable to dermarolling aftercare. It just has to be used at very low percentage. I guess some people may like it more because it's not greasy and occlusive. For me, it's just my preference to have the grease occluding my needled skin from the environment. @Sarah: Thanks for the information on the "fan club." I'm a new official fan of the ointment as well. I'm glad to hear that many people like Infadolan like me. By the way, after the third dermarolling experience with 1.5mm stamp and roller, my skin looks better. I am also starting to roll my skin with 0.5 mm every week, after I know how my skin heals with longer needles. My scars look shallower. The texture of my skin look smoother. It is improving. I'll update with my picture after 6 months. To Chrissy: Not to apply strong anti-inflammatories only applies right after dermaneedling. Some hours later or a day after, it is already OK.
You should not apply it right after if it is strongly concentrated. The weaker the better. To Future Perfect: That is good news! Please keep us posted.